I’m going to try and recreate the context for this one from memory. Wikipedia and – god forbid – YouTube make this a pointless exercise, I know… but then that’s rather appropriate, wouldn’t you say? It Ain’t Half Hot Mum was a British sitcom of the 1970s, set in…. Burma? During the second world war? The hook was that a tyrannical and pompous sergeant major, played by Windsor Davies, had been put in charge of a squad not of soldiers but of entertainers, who were out in the jungle to boost the troops’ morale. I can’t remember if the entertainers were meant to be any good or not (“Whispering Grass” surely suggests not!) but certainly they were terrible soldiers, much to the unending dismay of Davies. This isn’t a bad set-up for a sitcom in the short-term, and It Ain’t Half Hot Mum was a roaring success in its day, but is rarely repeated now because it drew a disproportionate amount of jokery from two sources: i) misunderstandings between the squad and the comical natives, who I seem to remember were generally white actors ‘browned up’, ii) clashes between Windsor Davies’ character and Melvyn Hayes, who played a nervous and effeminate gay man. Both men are good comic actors and I found these second gags hilarious at the time, but I was 5 or 6. Neither of these wells of humour is drawn on for “Whispering Grass”, though it’s quite bad enough without them. I’m assuming this is straight out of the series, probably an episode where they give a concert party, and someone falls ill, and so the Sergeant Major has to sing… WITH HILARIOUS CONSEQUENCES. That’s the only way I can explain the weird structure of “Whispering Grass”, which starts with a bit of Davies in-character, and then gives you most of the song with Don Estelle doing an adequate nostalgia turn, and just as you might be settling into enjoying the song back comes Davies doing it as an awkward spoken word. There’s no joke-value in the first half and no pop-value in the second, so whatever you’re coming to it for you’ll be disappointed. After Henry certainly began on the BBC (on Radio 4) and was the first of many, I think, to make the big leap from radio to screen. Many, including me, would say that it worked best as a radio three-hander. It also had me combing London for a recording of George Gershwin’s Three-quarter Blues. Up The Garden Path followed the same path later on. That wasn’t improved by the move either. I remember “After Henry” on Radio 4 but not the tv series. It’s all too easy churning out the worst ITV “comedies” but Auntie not infrequently came out with some quite astonishing rubbish also. “Rosie”, for example (nothing to do with our dear fellow blogger) and more recently “Bloomin’ Marvellous”, starring Clive Mantle, who I used to sit next to at Chelsea when I was a season ticket holder (circ 1997). I wanted to tell Clive this, ready with the “it’s not your fault, it’s the script” bit but decided not to. Actors are very sensitive/easy to offend creatures and Clive is a bit of a big lad. Rosie, the lovable yet unfunny policeman and unacknowledged forerunner to scintillating long-running ITV cosy cop show Heartbeat. When I was small I used to gamely watch IAHHM in the hope that this week the Japanese would attack and the programme would turn into a war film. This never happened. I remember Outside Edge, although I wouldn’t have called it a sitcom as such – maybe because it was shot on film and IIRC had no studio audience. Brenda Blethyn was in it. and here they are in all their glory . I thought this thread had been revived because of the quote from Peter Sallis that made the news yesterday – that “Last of the Summer Wine” was almost stillborn because Michael Bates, who was somewhere to the right of Margaret Thatcher, and Bill Owen, who was somewhere to the left of Lenin, were arguing about politics within minutes of meeting each other. Wonder how that influenced Bates’ relations with the cast on IAHHM? Rosie, i.e. “Chief inspector Penrose” in his dreams, was one of those BBC comeedies where everyone in it was funny except the lead part. Don Estelle had a No.1 record. Did any of you piss takers? 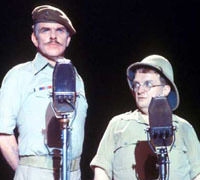 Don Estelle had a lovely voice, and was a singer before and after ‘It Ain’t Half Hot Mum’. Such comments don’t surprise me though. Oh so clever, talentless piss takers who knock someone’s talent because it doesn’t appeal to their modern sensibilities. Tossers. I’ve had quite a few #1 records actually. In my collection. Not this one though. No. Not this one. And so we say, farewell Windsor Davies – the wrong Windsor this week, perhaps. Just to let you know that someone read your comment. Happy memories from 1975 – crap song but hey! I didn’t care.